This rug is everything and more! The quality is very good and the color was spot on with the picture. It shipped supper to fast to my front door. I look forward to my next rug purchase! I bought this rug for my daughters bedroom. The room is large and the rug helped to pull the room togethers. The colors are great and match the wall paint perfectly. I would definitely purchase this rug again. Beautiful rug that ended up being slightly larger than I realized. 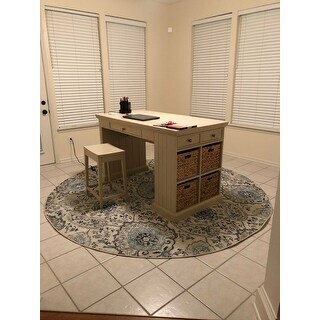 The rug dimensions are correct, I simply made a mistake for the area I put it (my dining area). The rug is not overly thick, but the pattern is spot on for the pictures. It works beautifully with the table and cushions in my Japanese style dining area. The picture here on the website is spot on. The colors are exactly as shown, with a symmetrical Paisley pattern. I will be using in the dinning room under a round table with 6 chairs. The rug is a little thin, but this is expected with price and the materials used to manufacture. I would give 5 stars, but I don't actually know how its going to hold up over time. I do expect to have to replace it at some point considering price. The rug is beautiful in my room. It is thin, but still beautiful! We are very pleased with our purchase. Beautiful piece! High quality rug, beautiful colors delivered quickly and the product is as-expected. Lovely piece, I didn’t purchase a round pad so I did have to cut mine to fit. This rug is beautiful. I would purchase a non-slip back for it if you aren't putting heavy furniture on it. The colors are just as pictured. It is a little thinner than I thought it would be. Love this rug! It Matches the other two I purchased for my formal dining area perfectly. This rug sits well under my four person round kitchen table. Arrived quickly! Love the colors, shape & appearance! Looks great in my living room. Rug a bit thin but I guess I knew that from photos. Wish it was a bit more plush, but for the price it is a fair value. Delivery was fast and free. Be nice if they would ring the doorbell upon delivery. I was home and it was raining. Thanks? I love it and it looks like the picture. It is durable and already has held up to gentle Spot cleaning in the dining room! Love the rug, the size, the color, and the packaging for shipping. Good product! Absolutely Beautiful, everything I order from Overstock is always even better than expected. Love Love it !!! Love the size, colors and texture of this rug! Perfect fit for under a round coffee table with pull out nesting stools. Love the color and the style. Great price. "It says there is cream color in the rug. Is that just the background?" 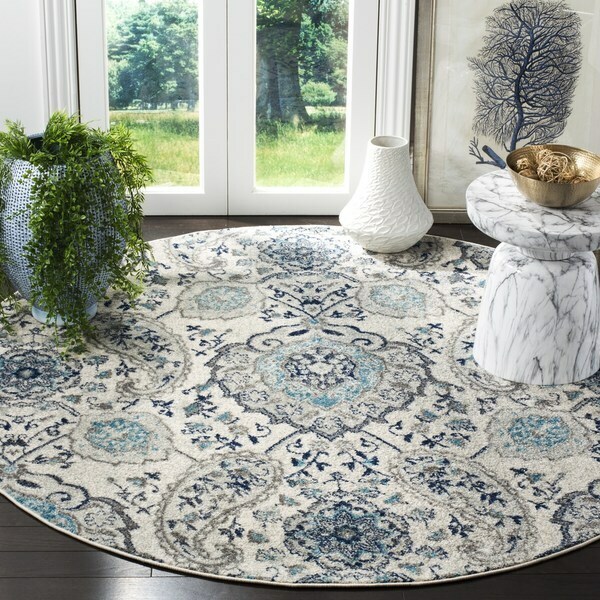 This rug has a cream background with grey and blue tones in the design of the rug. Please note that colors may vary due to dye lot variance in production. "Is this rug flame retardant?" This rug is California Proposition 65 compliant.